We're all human. We make mistakes from time to time. Enter Articulate Engage's customizable spell checker! Press F7 on your keyboard. Go to the first tab on the ribbon, and click Spelling. Go to the first tab on the ribbon, click the drop-down arrow beside Spelling, and choose Spell Check. Go to the Format Text tab, and click Spelling (looks like a blue check mark). Engage will let you know if it encounters any words it doesn't recognize. Use the Spelling window to correct or ignore the highlighted words. Click the round Articulate button in the upper left corner, and click Engage Options. 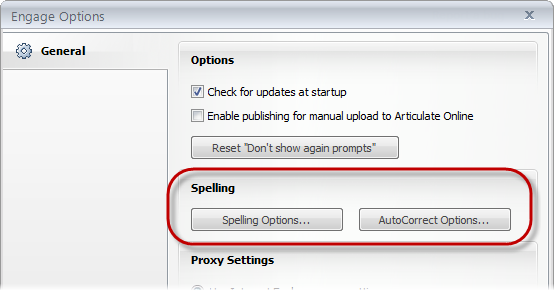 Then click Spelling Options or AutoCorrect Options. Go to the first tab on the ribbon, and click the drop-down arrow beside Spelling. Then choose Spelling Options or AutoCorrect Options. For help customizing these options, see Spelling Preferences, Proxy Settings, and Other Options.